Indian River’s Zachary Schultz takes a shot in IR’s 8-10 loss against Gunston School on Friday, March 29. 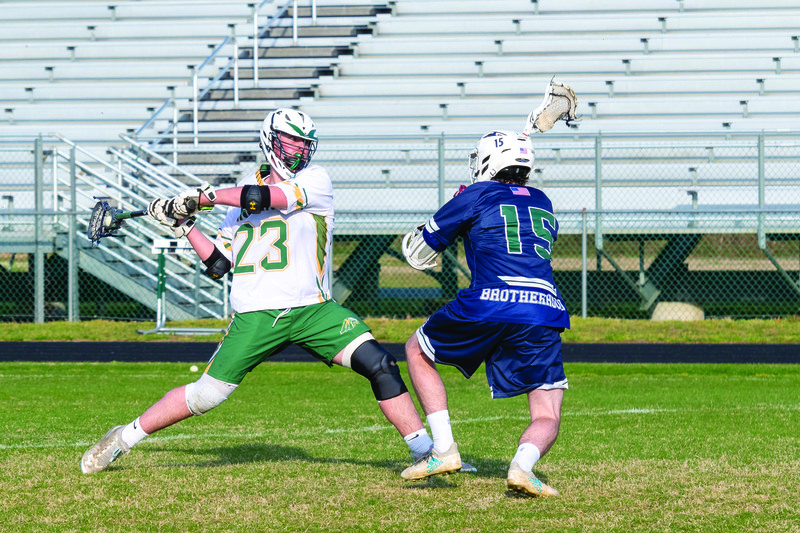 After three tough season-opening losses by a combined five goals, the Indian River High School boys’ lacrosse team wasn’t discouraged, like some teams would have become. Rather they used those setbacks as learning experiences and, boy, have they turned things around. Over their last three games — all wins — the Indians have taken down state power Caravel Academy (6-4), Sussex Academy (13-0) and, most recently, Woodbridge (14-4) on Friday, April 5, by a combined 33-8. Against Woodbridge, the Indians started with the pedal to the metal and never looked back. IR would score five goals in the first quarter and added two more in the second, to take a 6-1 lead into the halftime intermission. A five spot in the third to make it 11-2 erased any hope the Blue Raiders might have had of getting back into the game, and the Indians closed things out with a 3-2 advantage in the final quarter of play for the final margin of victory. Junior Thomas Harris and sophomore Ryan Furman led IR with four goals each. Senior Zach Schultz added a hat trick, while junior Ben McCabe chipped in with two, and sophomore Ben Spencer added one to the offensive effort. Furman was credited with a pair of assists, while Schultz, McCabe and Dylan White each added one helper. Speaking of playing good defense, goalie Sam Miltner made seven saves against Woodbridge, but he has a pretty solid group of fellows helping to protect the cage in front of him — namely Patrick Spencer, Ethan Forrey, R.J. Rybicki, T.J. Moore, Broden Carney and Luke McCabe. In their game against Sussex Academy on Wednesday, April 3, the Indians once again put on an offensive clinic with five first-half goals and another eight after the break. Ben Spencer and Schultz each had four goals against the Seahawks. White chipped in with two, while Harris, Furman and McCabe each had one. Miltner made 15 saves for the shutout win. A key Henlopen Conference South Division contest was up next for the Indians on Wednesday, April 10, after Coastal Point press time. Results will be found on the Coastal Point sports Facebook and Twitter pages. Games against the likes of Milford and Lake Forest (who had beaten IR, 8-7, back on March 27) — two of the best in the South Division — are the ones where Spencer is hoping his team can use the early losses as learning tools to put their best foot forward. The Indians will also host Delmar and Woodbridge following their home date with Milford, leading in to their road contest at Lake Forest on Friday, April 26.